Last season the Bowling Green hockey team found out the hard way what happens when you look past Alabama-Huntsville. The Falcons did not do that this go-around, taking care of the Charges with a pair of wins and a 9-1 scoring margin. Obviously it was about as good of a weekend as BG could’ve hoped for, but watching these games something just didn’t feel right. I don’t know what it was or what I really mean by that. It was just a weird vibe I had. Well, in talking to coach Chris Bergeron after the second game, he had a little insight to that. So those are kind of the best, when you pick up a weekend sweep but still have teachable moments for Monday’s practice. 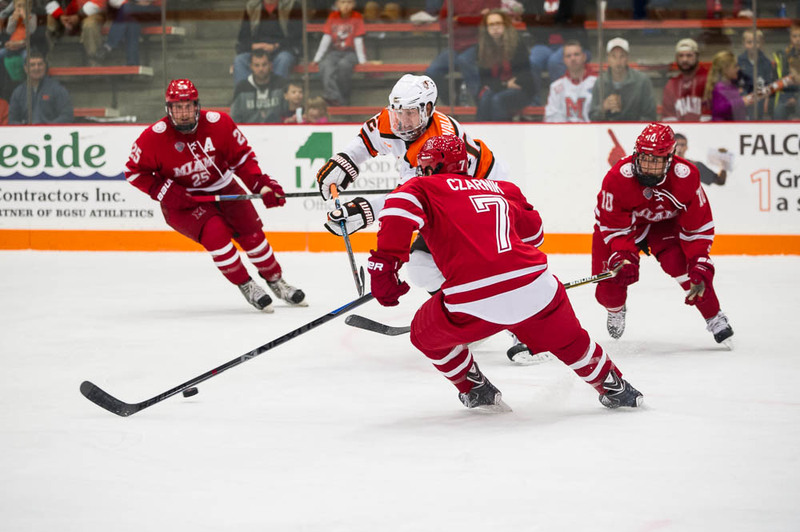 So now for the second straight season, BG has swept its first WCHA series of the year. You can make an argument that this (along with last year’s home series against Alaska-Anchorage) are two series the team should have swept, and you’d be right. But that’s a step this team needs to make: taking care of the teams it should take care of. Every point matters, and every team in this league has the potential to win on any given night. Getting into a rhythm now is good and we’ll see where it takes the Falcons this year. Let’s get into it. In net: If, after four games, you had your bets on Tommy Burke being BG’s worst statistical goal, please tell me the numbers for the next mega millions, because I don’t think many people would’ve guessed that and you clearly have some talent. It’s not even that Burke played poorly in his one start. But through two games, Tomas Sholl has a 1.50 goals-against average and a .932 save percent, and Chris Nell didn’t allow a goal in his only start, so yeah, math doesn’t lie. I was sort of surprised Sholl was the other goalie this weekend. As has been documented, Chris Nell was going to start a game this weekend. The question because who would be the other guy that made the trip. My bet would’ve been on Burke, but in taking Sholl, that shows how much he has improved just since last season. After pretty much losing his hold on the 1A, 1B tandem in net, he’s come on strong through two starts. Granted, yes, one was against a Huntsville team that averaged barely over a goal per game last year, but if you remember back to last December, Sholl gave up four goals and was the losing goalie in that game to Huntsville, so it was nice to see him rebound this time around. Where this goalie battle goes from here, I have absolutely no idea. For home series, they can kind of make the call of who starts in net on the fly. But going into a road series this weekend with Clarkson, the coaching staff will have to decide who plays before the team leaves for Potsdam, N.Y. You can only take so many players on your travel squad, so if they take three goalies, that’s one less skater they can bring. With all three goalies having played now, there’s no more “we need to get this guy a start this weekend,” but rather the two best goalies can be the ones brought on the trip. Not at all implying Nell didn’t deserve his start Friday — obviously he did — but when you go into a weekend already committed to getting one guy a start, that kind of limits you. I would imagine, assuming he has a good week at practice, that Burke gets a start this weekend. Don’t want the guy who was your No. 1 the second half of last year staying home for back-to-back weekends. But you never know. As far as I can tell, the battle for playing time is wide open, and whoever earns the starts will get the starts. That’s the good thing about having this wide open goalie battle; the staff isn’t married to one guy, which means they can roll with who they think is playing the best, and not necessarily the guy who has the most experience. As I said last week, this will be fun to monitor this year. It’ll be even more fun if we’re monitoring it because they’re all playing well. PPG: No, I’m not talking about power-play goals, although with four power-play goals on the weekend, BG is off to a good start there. No, I’m talking about points per game. Through four games, the Falcons have five players averaging at least a point per game. The most impressive of the group have been Kevin Dufour and Nolan Valleau. No, not just because Dufour’s six goals and Valleau’s six assists lead the team, but because they’ve been consistent through two weekends. Dufour has three goals in each series. Valleau had four assists against Miami, and two against UAH. I almost went bonkers at my desk Friday when the box score originally had him with two assists for the third straight game. When was the last time that happened? I was determined to find out. Ultimately, he only was credited with one in the game, so I dropped that crusade, but still, he has a point in every game of his young BG career. For a team that has been hurting for blue line production since I’ve been covering the team, his start is really good. Then you get to the others. Brandon Hawkins scored twice and had two assists this weekend, and now has five points in four games. After going pointless against Miami, Pierre-Luc Mercier had a four-point weekend, and Matt Pohlkamp had a goal and two assists. Throw in Dufour, and that trio of sophomores is improving nicely off solid, 16-point freshman years. They found themselves all on the same line Friday — something they did a bit last year — a teamed up to do some damage. Mercier assisted on all three of Dufour’s goals this weekend. His fourth assist? Came on Pohlkamp’s goal. Both of Pohlkamp’s assists game on Dufour goals. Those guys are clicking this year. They started last year on the same line, an experiment that didn’t last too long. But Dufour and Mercier stuck together and made of two thirds of the ever famous “Wally and the Q’s” line. They are guys you’d hope would provide strong secondary scoring this year. The thing is, the way they’re producing, it’s been primary scoring. Top dog: Let’s just revel in the fact that, at least for the week, BG is tied for first in the WCHA. Enjoy your week, and we’ll see you for power rankings tomorrow.